Insider Secrets to the top 5 things to look for while buying Gemstones online like a professional for the best buy price wise/ quality wise. The gemstones can be worn for any reasons due to healing and protection, beauty or any other purpose, but ensure you buy the genuine gems. This gives you the entire value of the gem which is worth the investments. In the recent years, just like other items, even buying gemstones online has become too common. After all, it is the most convenient and comfort zone to buy gemstones online by making few clicks. Below are some of the steps that you need to consider while buying gemstones online. By following these steps, you will be able to take the right decision in the entire buying process. While buying the stones, gemstone color would definitely be the important factor to be considered. Ensure that the color of the gems is pure and no mixture of shades is found. 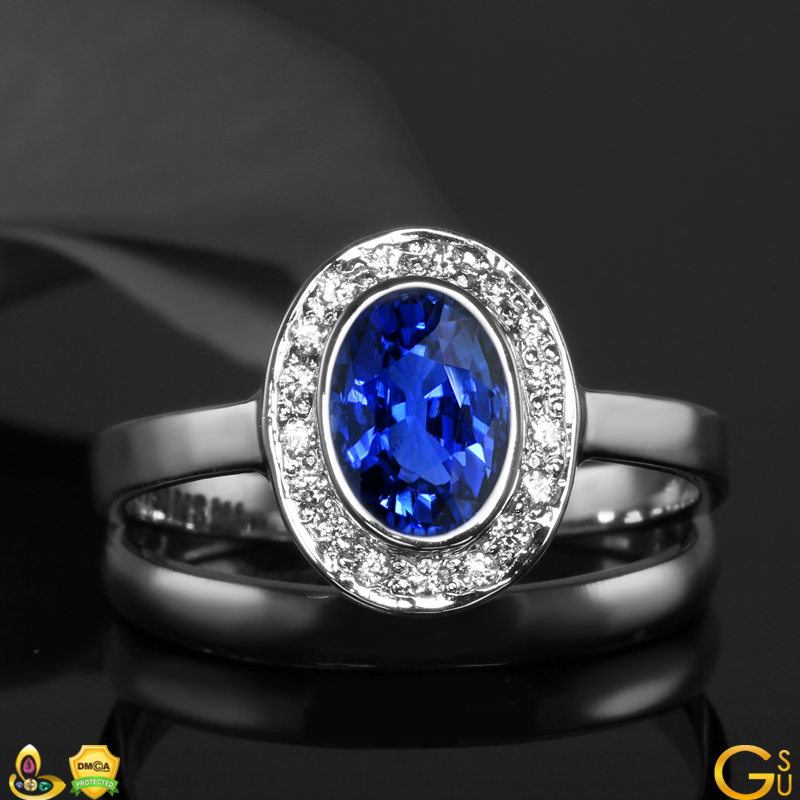 If you wish to buy blue stones, you should know that the blue color varies from the bluish green. So, do not get confused. The color of a gemstone is based on its hue, saturation, as well as tone. You should check the tone and saturation first, which must be higher; so that, the color comes up better and purer. While, the top shades are found to be the true colors that arrive with a single shade and no other color is mixed. The only thing is, the owner of the website from where you wish to buy these gemstones, should provide the right photo shots and if possible high quality video of the gems. This assists to get better idea, and taking decision becomes easy. With the perfect photograph of the gems, you will get clear idea of both the color of the gem as well as its clarity. Since there are several dealers who sell the gemstones online, you need to find the right dealers. To find out the right dealers, first thing you have to do is to compare the color and price of the gems before deciding to buy. Though it might be a toughest job to compare the price of the gem per carat, you can compare the prices considering 2 gemstones of the same weight. 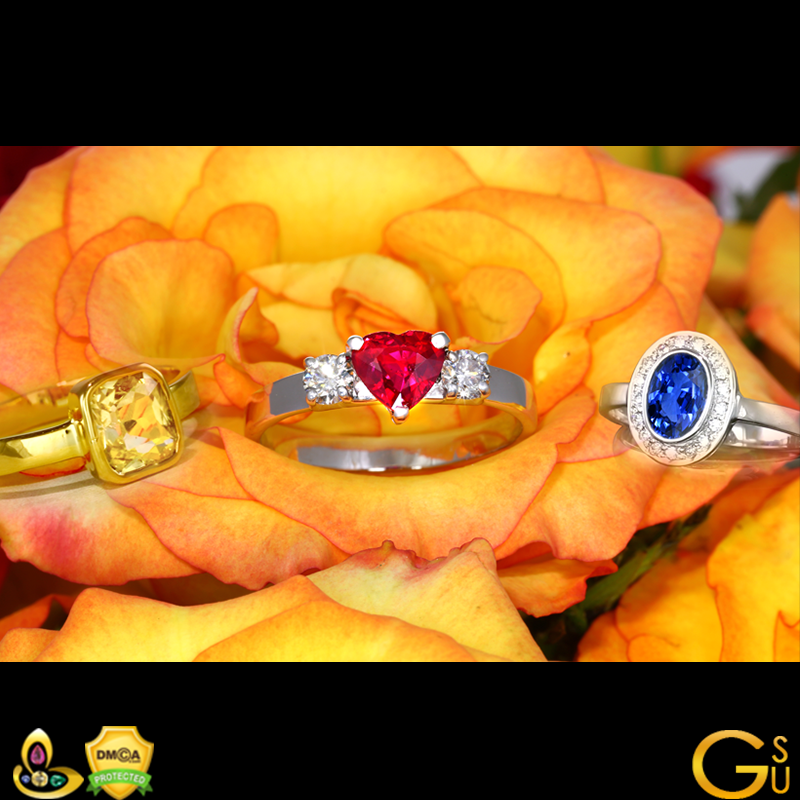 The prices of gemstones vary as per the quality and purity. When you buy gemstones online, you should also check for the treatments done to the stone. Heating is one of such treatments applied to the gems. While the price of such type of stones are usually less compared to the untreated stones. Suppose you are buying stones just for the astrological purpose, then better you buy the untreated ones. Else heat treatment would destroy the stone qualities bringing negative effects. You may be interested in knowing the origin of the stone, and this can make you to invest on the right gemstone. If you have the idea about the origin, you can buy the product with ease without many struggles. 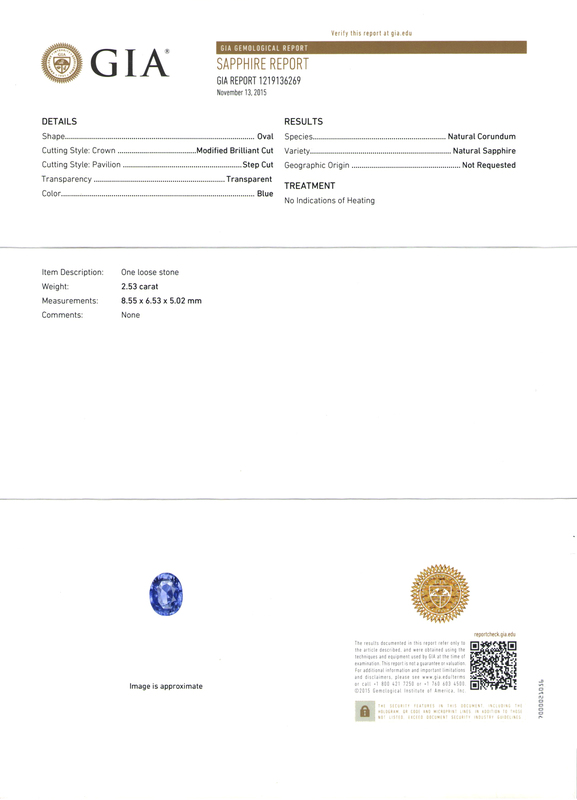 When you buy gems, ensure to check the certificate from the independent and well-established gem lab. This type of certification will definitely add value to your purchase. Thus, always check for the certification before buying. These are the few things that will assist you in making the best buying decision of the precious gemstones. – This Ruby Lot is named as: “Agni” after the fire element which represents the primary planetary Energy of its planetary Lord Sun. 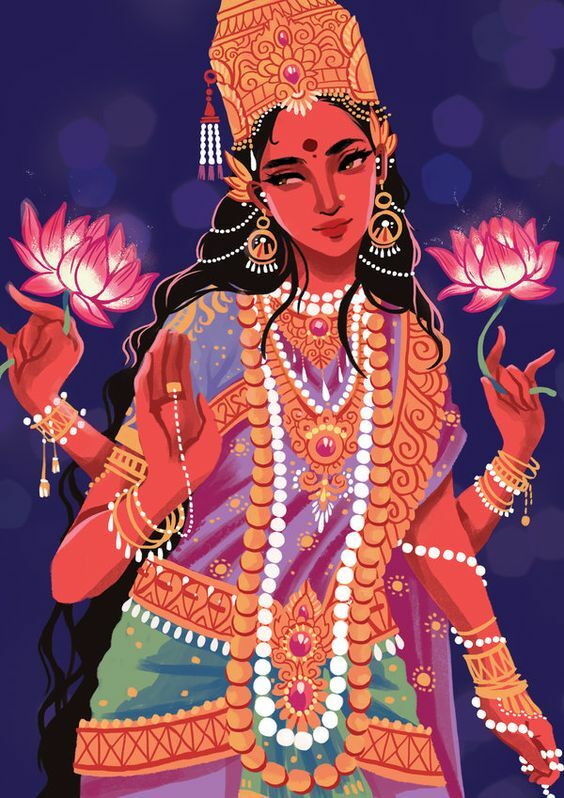 – The Colour is a Vibrant Pinkish Red almost akin to the Kaner Flower which is very dear to Lord Surya and is offered to as Arghya to Lord Sun. – The clarity is 96% and higher which is very rare in a fully natural, unheated Gemstone. 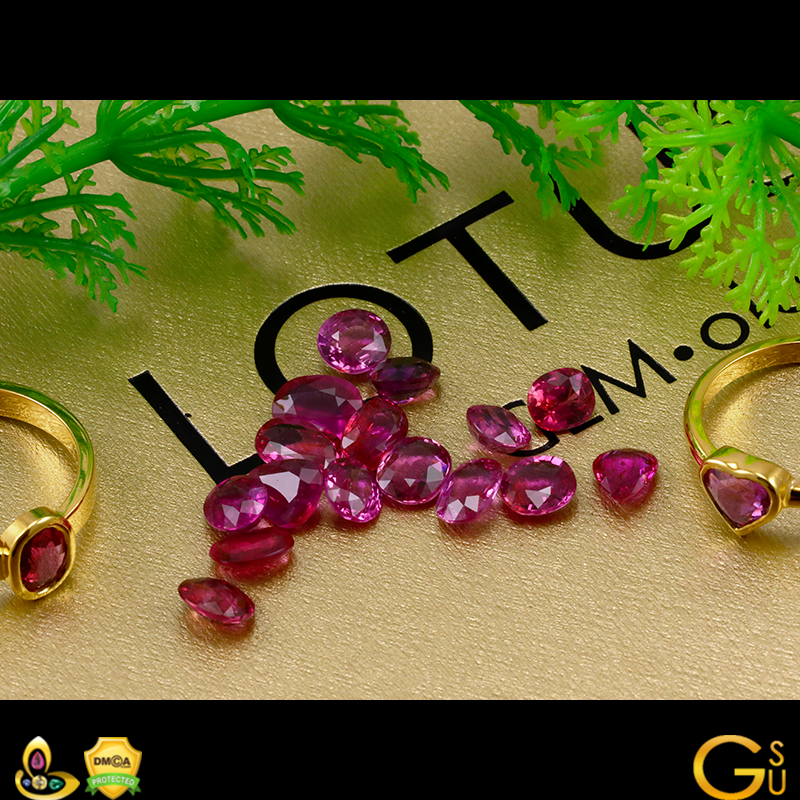 – Each single ruby is beautifully cut, full of lustre, auspicious and full of purity. – Free from any of the flaw as listed in the sacred texts. – True Jyotish Gemstone that shall deliver cherished results that only Jyotish Gemstones are capable of delivering. – Cut from our own rough so backed by our unmatched price policy. Breaks the market trend of the past 5 years. Find us a better priced Ruby and supply to us at double the rate. Deo Amabiles Et Hominibus-Pleasing to God and to Men. 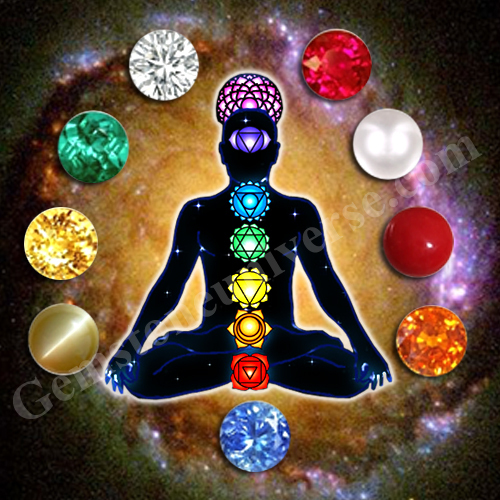 The 9 Gems also called as the Navaratna representing the Navagraha (The 9 Planets) find extensive use in both Ayurveda as well as Yoga. In Ayurveda several medicines are made using these 9 Gemstones. Some notable medicinal preparations that advocate the use of all nine gems are the The Navratna Ras, Navaratna Kalpa Amrit, and the Jawahar Mohra. Ayurveda believes that these sacred Gemstones provide a high quality of micro nutrition to the body as they are formed over million of years in high mountains, forests, Oceans and contain some rare elements are generally not found commonly in the earth’s crust. In yoga, the Gems are used to awaken the Kundalini- The dormant, innate power of divinity that rests at the base of the body. The complete realization/ Awakening of the Kundalini leads to self realization and self actualization. Comments Featured Today is an Elegant Blue Sapphire and Diamond ring set in Silver. The Centre Stone is a beautiful Oval Ceylon Sapphire of 2.01 carats. 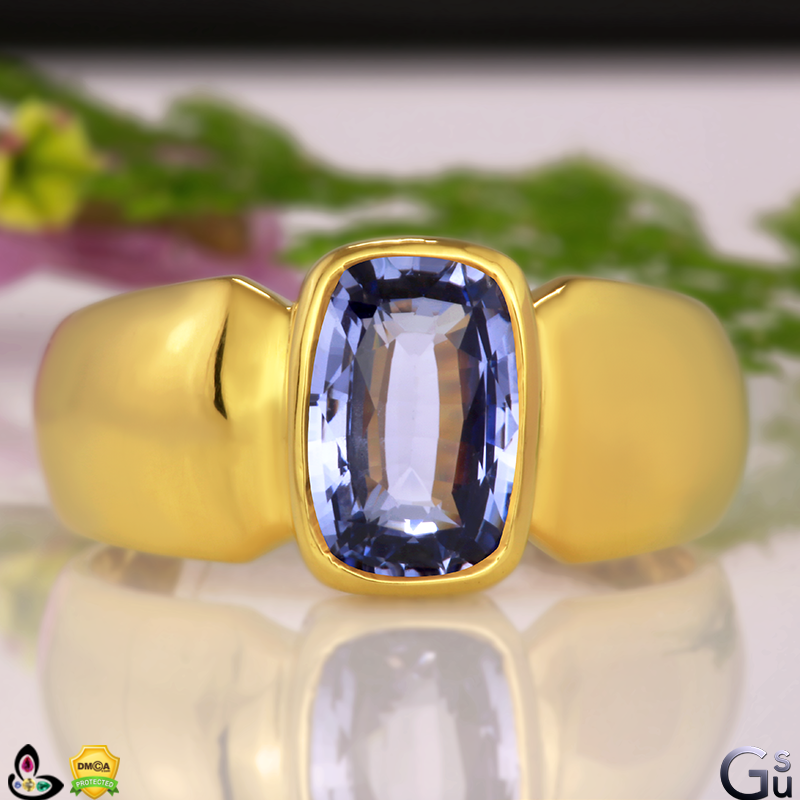 This Gemstone originating from Ratnapura Srilanka is unheated and full Natural. Notice the pleasing medium Blue colour spread evenly in the Blue Sapphire crystal. Nearly eye Clean which is rare in Unheated Gemstone, the beauty is accentuated by the halo of small Diamonds that enhance its beauty manifold. A Sattvik (Pure gem) that is ideal for Healing, Medicine, Yoga and Ayurveda brimming with the powers of Lord Saturn. 2017 be a milestone year for you ushering in the gifts of Good health, happiness, abundance and prosperity. We are focussed in our mission to take Planetary Gem Therapy to new heights and would like to thank our dear patrons in advance who will give us a chance to be a part of their life journey through Gem therapy and the blessed Jyotish Gemstones. With your support we shall live the values of our motto- Deo Amabiles Et Hominibus– Pleasing to God and to Men this year also as we have done for 20 years in the past. It is widely believed that the Indian Civilization had the most advanced information related to Gems and their desired characteristics. In fact, the quotes made in sacred texts like the Garuda Purana and the Agni Purana baffles the most reputed modern day Gemologists as how these texts have been so exact in explaining the desired quality of Gemstones and specific traits to look out for in absence of tools like a microscope back then or how they have mentioned about treatments like heat and their extensive knowledge of flaws to be avoided in absence of modern day Gemological Tools and instruments. What is interesting is to know that how in simple tenets profound wisdom was communicated with exactitude. 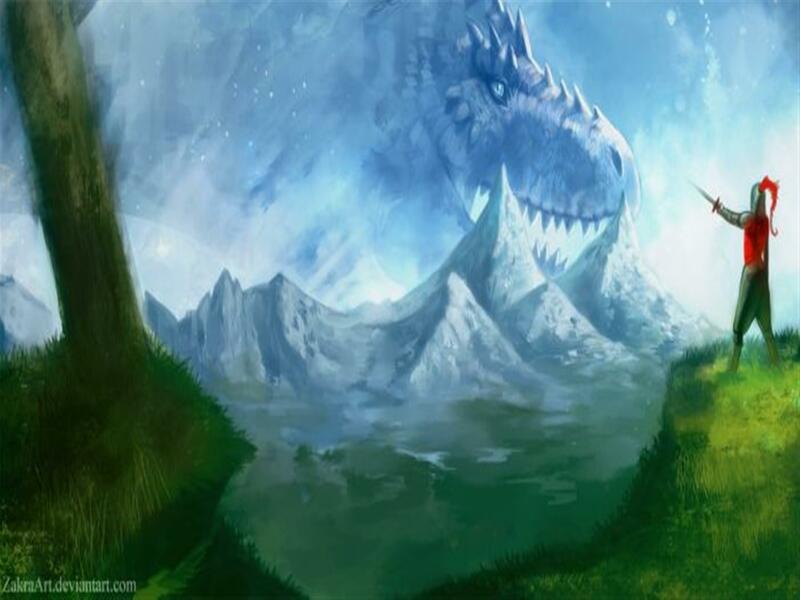 It is an ode to the power of the ancients. Ancient Indian Gemologists had a 6 step filter before considering the selection of an Emerald. Listed below are the 6 characteristics an Emerald must essentially possess before analysing it on other filters. This 6 step filter gives wonderful results and is a great time saver for the trained eye. – The emerald should have a rich, luxurious and even colour. For the common person the above could mean some general terms but in Gemological terms it requires years of training, appreciation of the importance of colour and a deep understanding of hue, tone and Saturation. 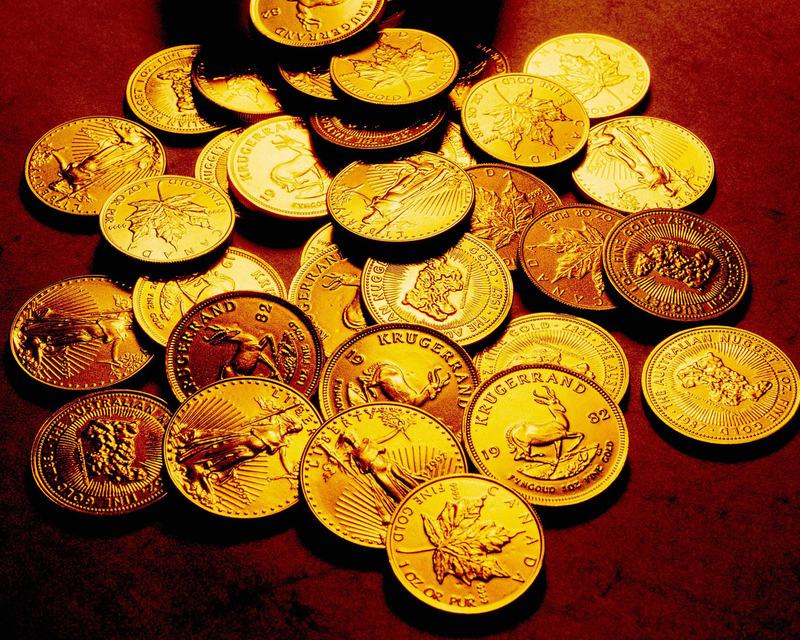 – Should be shiny and appear to have specks of Gold dust inside. – Should be free from any serious external and internal blemishes. – The Emerald should be properly cut for maximum Light Movement. If you view the Gemstoneuniverse Emerald Inventory you shall not find a single ordinary Gemstone. View any single Emerald and put the 6 step filter test to it. There is much more that we bring in by our expertise and information so that you get nothing but the very best. This is in line with our vision of 100% Error Free Gem Therapy wherein your soul focuses is your life and rest everything is taken care of by your team at Gemstoneuniverse. * Currency conversion as per exchange rate as on date of Shipping. 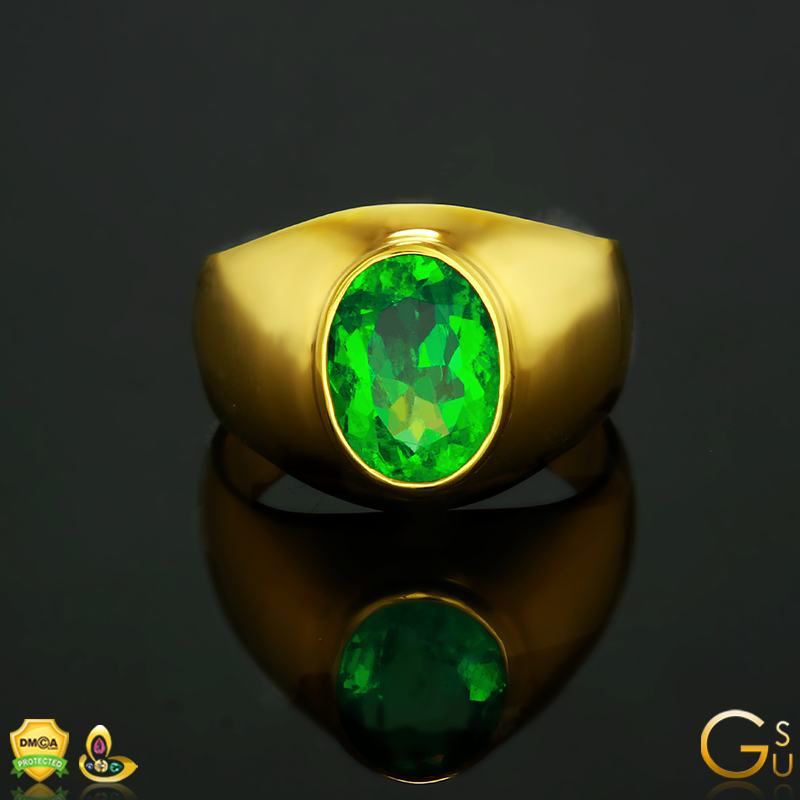 Featured today is a high quality and exceptional Jyotish Gemstone Emerald. This beautiful and rich Zambian Emerald is Oval in Shape and all of 2.112 carats. View the video to appreciate the warm soft glow, the richness in colour and the famed gold dust effect the sacred texts speak about. This emerald is brimming with the positive, vibrant and communicative powers of Mercury. The stunning contrast in beauty is made more evident by the warm lustrous halo of Diamonds (15 in number, exact weight .48 carats). The verdant green of the Emerald is highlighted by the royal lustrous white of the Diamonds. 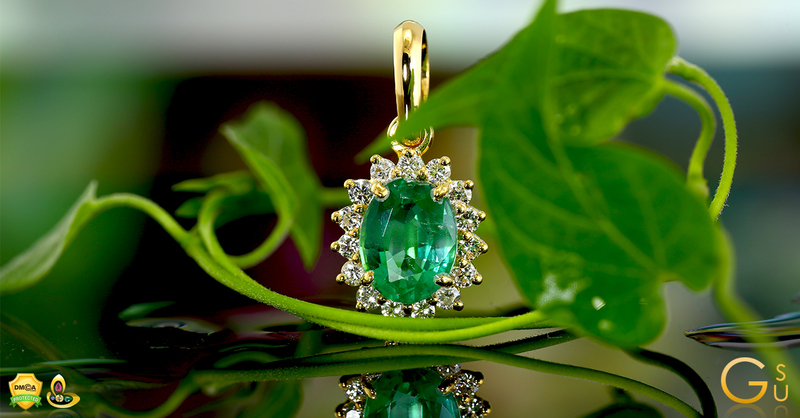 What you get is a stunning high-end luxurious Emerald Diamond Pendant that is sure to be a show stopper. A True Jyotish Gemstone that shall deliver results only pure and saatvik Jyotish Gemstones can deliver. 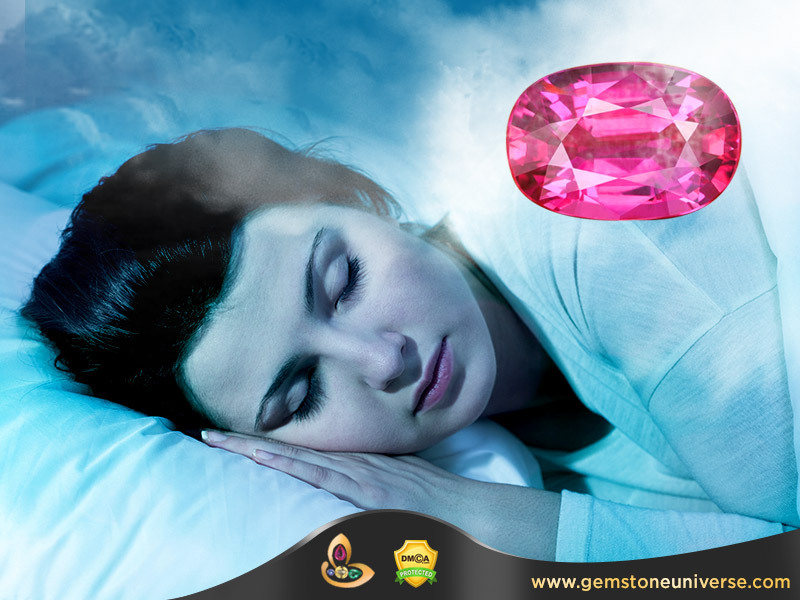 What does seeing different gemstones in the dream signify? Since Times immemorial seers, saints have given different interpretations of seeing different gemstones in the dream and their significance. Seeing a Gemstone in a dream is a very special and unique occurrence and special characteristics and significance has been attributed to each unique gemstone. 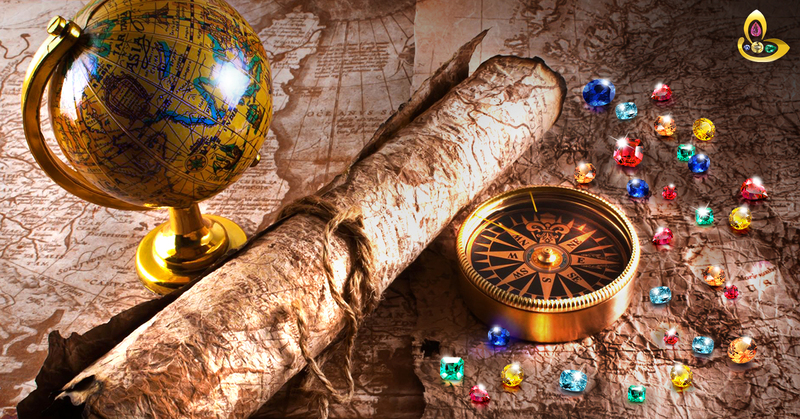 Dreams of Gemstones and their significance first find mention in ancient Hindu texts. One of the authoritative books composed on this subject is the Acha-Metis of Arabic origin written around 8th century AD. Many of the interpretations written in this book are referred to a Hindu source. Have you seen a Gemstone in a dream? Do Let us know. 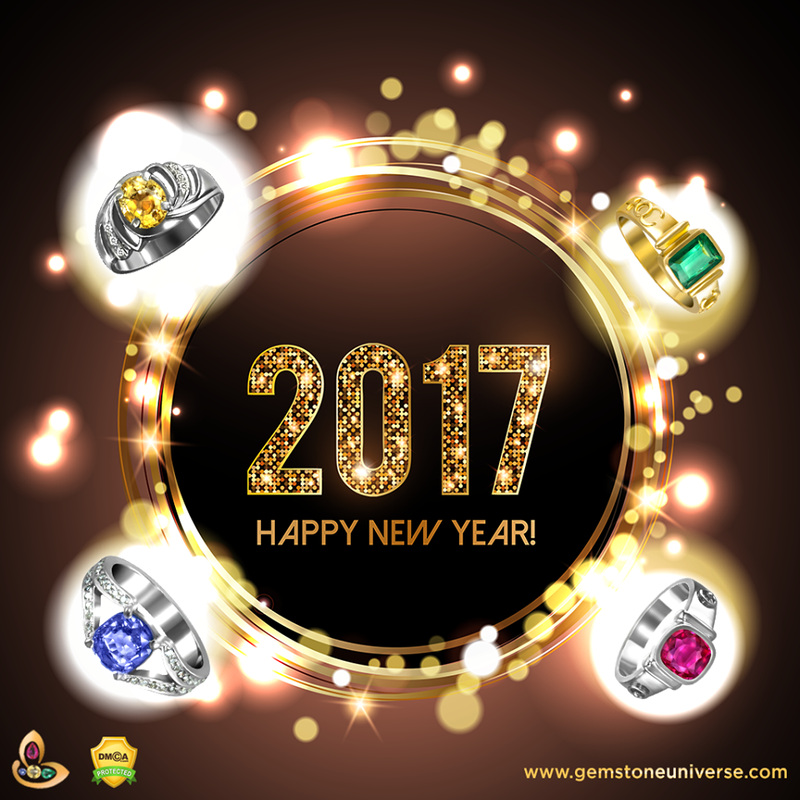 We thank all our viewers, patrons and partners for your love and continued support in the year 2016 and all of us at Gemstoneuniverse join together in our prayers and wishes that the coming year 2017 brings with it the blessings of Health, wealth and happiness in your life and may this year be one of the most memorable year for you and your loved ones. Here is one message and share from one of you patrons in December 2016. Mr. Supratik Choudhury is the Country Director of one of the large Global MNC’s. In this video he shares how gemstones & gem therapy have impacted his career and how a Gemstone was able to fill a missing gap in his career. We hope and wish that many of You will come forth this Year to share your experiences for the greater good and we promise that continuing our work, commitment and passion of the last 20 years we shall continue to raise the bar higher in serving the sacred science of planetary Gem Therapy, Jyotish Gemstones and you and follow our motto of Deo Amabiles Et Hominibus– Pleasing to God and to Men. Having trouble in staying on a path? Motivation petered out? Make Discipline your friend over motivation and win with a Blue Sapphire. Man’s quest for improvement in life and life conditions is an innate need and is as ancient as Time itself. Every single individual is looking for improvement and go to a notch higher. There might be financial goals, better personality; higher insight into spirituality, gain of wealth, better self esteem, better speaking ability, better body image and man does make endeavours to reach these higher goals. Some people are highly motivated and make real time efforts to better their life and life conditions but unless a person is very strong soon intensity of motivation runs out and the life betterment process is aborted or abandoned. What does a person do in such a case? 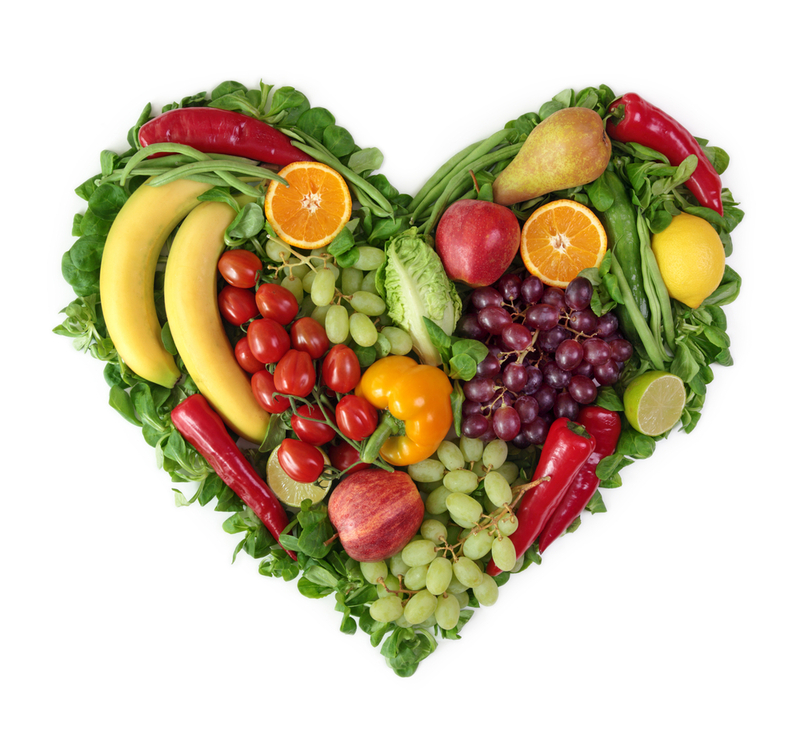 Ever thought of how many times you tried to lose weight by dieting, exercising, walking etc. You start with strong motivation and effort and your initial week’s commitment, performance and process is near to perfection but most people abandon their diet and exercise protocol between week 6-week 12. Why is that? Even though there is a lot of play of hormones internally, this write up is not about endocrinology and hormones. Something makes your steam go 0 and the initial motivation fails. It is in situations like this we need to harness the ancient wisdom that says Make Discipline your fundamental agent and choice of change than motivation and you are likely to stay the course and accomplish what you set out to do. 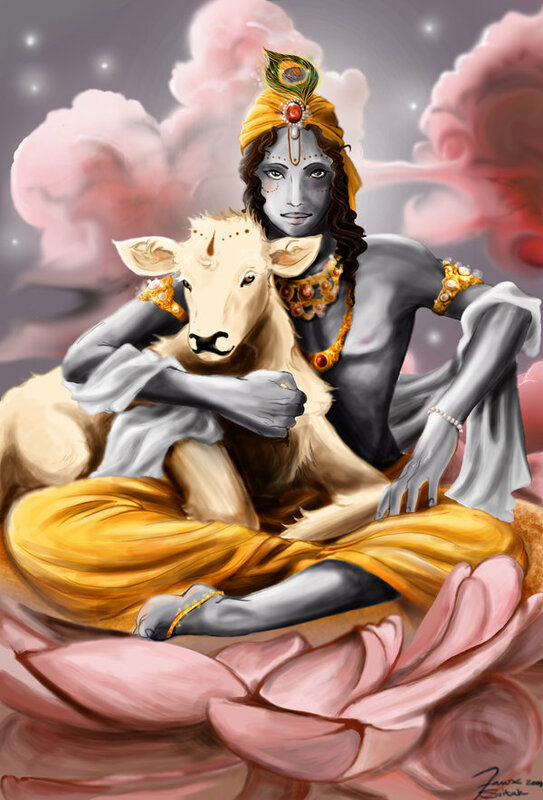 Lord Saturn/ Shani dev is the planet that blesses the individual with Discipline. Saturn owns the two most pragmatic signs of the Zodiac- Capricorn and Aquarius. Both these signs have the innate ability of planning, organizing, strategizing and staying true to a process plan once it has firmed up by various experiments and conclusions. 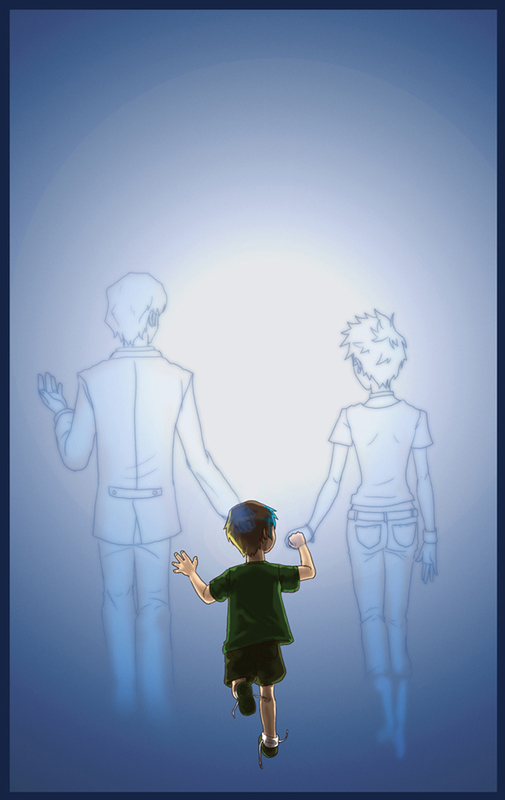 They never go against the process once that is finalized. In other words they strictly follow the play book. Saturn blesses the Individual with pragmatism, practicality and respect for discipline, organization and Strategy. 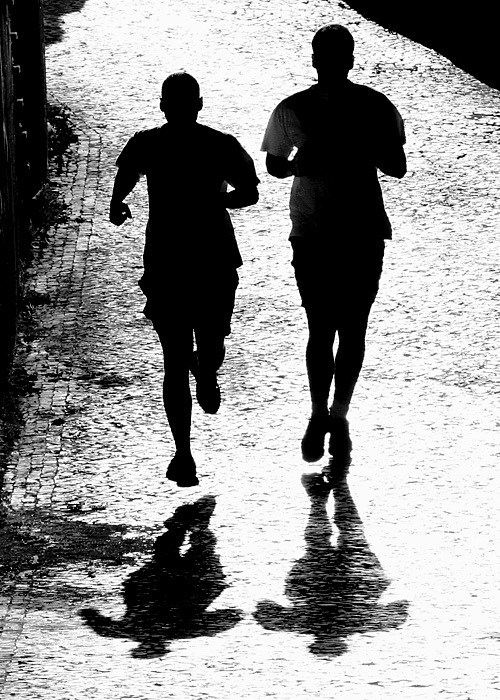 If you are one who faced defeat by motivation choose discipline over it and you are likely to succeed more often. Saturn cuts you from the flight of fancy and lethargy and blesses with discipline. The Gemstone of Saturn is the Blue Sapphire and if suitable to the individual blesses with the 3D virtues of Discipline, Dedication and decisiveness. All these 3 put together fight failure to stay the course. Whether it is life or a diet you need to stay on course and Blue Sapphire will give you the resolve with the power of 3D to achieve and bring change for the better. * Conversion Value at the date of featuring of the ring. Featured today is an exquisite Blue Sapphire with violet tones. Also called as Indraneelam this beautiful blue sapphire is fashioned as a cushion. Unheated Blue Sapphire from Ratnapura Sri Lanka it is cut to precision for maximum movement of light. View the Brilliant lustre and scintillation of light. An eye clean natural unheated gemstone free from any of the flaws as described in the sacred texts. A true Jyotish Gemstone that shall deliver the promised results only Jyotish Gemstones are capable of delivering. Which is the Gemstone for Wealth as per Indian Vedic Astrology? Yellow Sapphire the Gemstone of Jupiter is considered the Gemstone of wealth as per Indian Vedic Astrology. There are many gemstones that create wealth, financial prosperity; windfall gains and the particular wealth creating gemstone will differ for each ascendant and the individual horoscope as per the planetary positions. For a very accurate wealth creating gemstone one should get their Gemstone recommendation done only after an exhaustive analysis of the birth chart/ horoscope by an expert. In General the Yellow Sapphire also called as Pukhraj in Hindi or Pushparaaj in Sanskrit is a wealth creating gemstone. It promises wealth, abundance, prosperity, financial freedom and freedom from poverty because Jupiter as per Vedic Astrology signifies these Gunas/ Qualities. Ruling the signs of Sagittarius and Pisces the Yellow Sapphire definitely blesses its wearer with wealth. One should aim for always gaining Su-Lakshmi as A-Lakshmi ( Not auspicious Lakshmi) brings with it stress, tension, diseases, bad habits. The Yellow Sapphire is the wealth gemstone that blesses the Individual with Auspicious Wealth-Su Lakshmi. * Exchange Value On the date of featuring the Ring. and how they empower the individual to bring in positive powerful results. 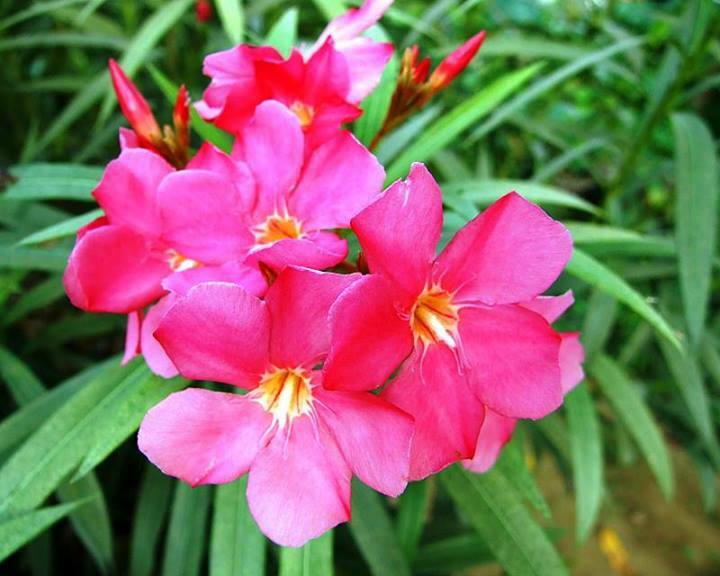 from the famed Ratnapura Sri Lanka has a very high lustre, brightness and shine. You can see how in a magical manner the scintillation of light is so high through every facet of the Gemstone. The color is most balanced medium golden butter yellow signifying the abundance of Jupiter. Getting a Gem picked by aGem Expert who understands the importance of colour with the right balance of hue, tone and saturation is a big plus. Remarkable and astounding near eye clean clarity make it a flawless gem of high value. View the video and compare price with all leading Internet websites of Natural and Unheated Gemstones of this calibre and you shall understand that this beautiful Gem is priced at least 6 times of average retail value. That is the power of Gemstoneuniverse and the Gemstoneuniverse Unmatched priced policy. 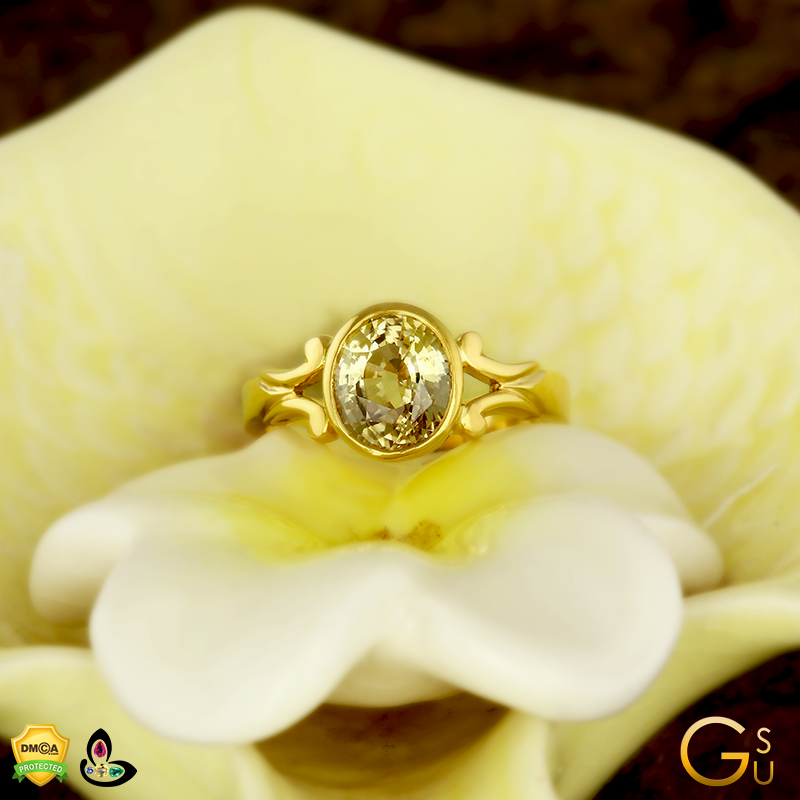 GIA certified Yellow Sapphire free from any flaws that give negative results. An uplifting, true Jyotish Gemstone that shall deliver the most promised and cherished results that only true Jyotish Gemstones can deliver. What are the Physical properties of the Green Emerald Gemstone? The most precious Gemstone of the Beryl Family is the emerald. Listed in detail here are physical properties of the Emerald gemstone including hardness, crystal system, specific gravity etc. A beautiful and distinct green color that ranges between bluish green to slightly yellowish green. Stones with a light tone or a low saturation should be called “green beryl” instead of emerald. 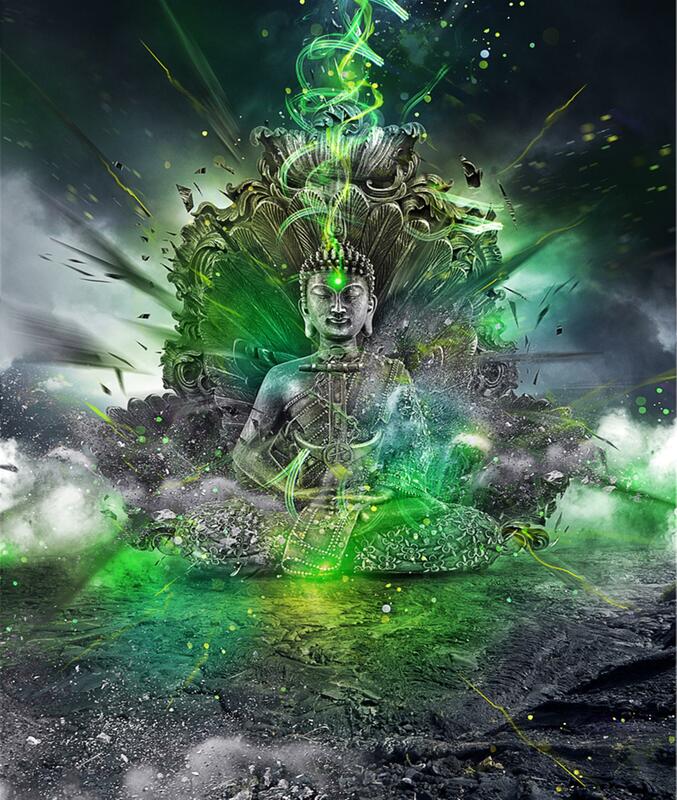 To know more about the sacred shades of emerald please click here. The Emerald Gemstone is always almost an included gemstone with distinct clarity characteristics. Majority of Natural emerald has eye-visible characteristics that can be inclusions, surface-reaching fractures, or healed fractures. To know Emerald clarity for Jyotish Purposes please click here. Compared to Ruby and Sapphire the Emerald is very soft but is an excellent gemstone when used for setting as Jewelry ring/ pendant, but majority of emerald specimens have inclusions and surface-reaching fractures that compromise their durability. One should not let harmful chemicals or acid come near the Emerald gemstone. It is also advised that Emerald be cleaned with lukewarm water, soft brush and gentle skin soap solution/ mild shampoo. It should never be cleansed in an Ultrasonic Cleaner. Emerald’s green color is caused by trace amounts of chromium or vanadium. Chromium is the Miracle Trace element that causes the red color in a Ruby and Green colour in the Emerald. Hexagonal. Often as prismatic crystals. 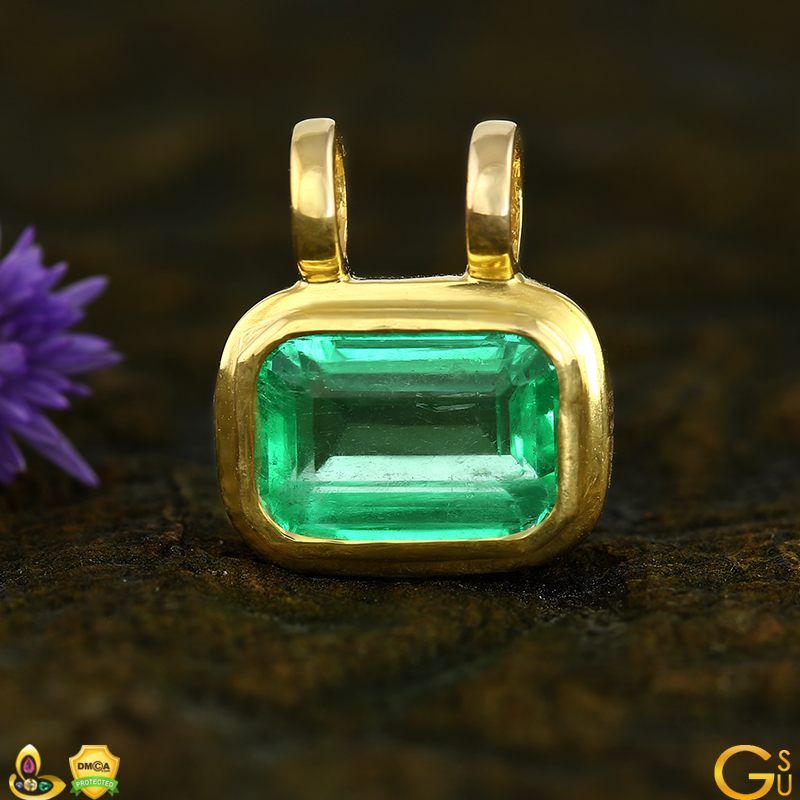 Please view the video of this brilliant Emerald Gold pendant to appreciate the 4C’s of cut, color, clarity and carat weight and also some of the Physical properties listed above. One such property discussed is the Lustre. View and admire the sharp, bright green glassy appearance as light travels through its facets. Beautiful and endearing brigh green Colombian emerald with exceptional clarity that makes it a special gemstone- A True Jyotish Gemstone that shall deliver the promised results only Jyotish Gemstones are capable of delivering. Set in an antique amulet like setting the contract of the high caratage of Gold with the Royal Green Colour Makes it an endearing piece to be cherished over a lifetime. Where do you find Emeralds in the world? The 3 most important gemstones in the colored gemstones market that are responsible for the lion share of economic and financial activity are Emerald, Ruby and Sapphire (Blue). Amongst these 3, the highest economic activity is generated by the Emerald that has been at the number 1 import in the USA for more than a decade. The trading of these Big Three is more than all other colored gemstones put together. For more than 5000 years people of different regions have enjoyed and appreciated the beauty of this precious green gemstone for ornamentation, beauty, investment value, rarity and its mystical powers. Traditionally 4 countries account for maximum commercially traded Emerald. Colombia, Zambia, Brazil and Zimbabwe account for the majority share of emerald production and trading. These traditional sources have decent and predictable production of this much loved Gemstone. Small quantities of Emeralds are also found in Pakistan, Afghanistan, Nigeria, Russia, Madagascar etc. The number of emerald mines in the United States is very small and the supply is sporadic. There is a small emerald mine near Hiddenite- North Carolina. According to the official reported figures this mine produced around 20,000 carats of emeralds only, between 1995-2010. The emerald is a rare, precious gemstone and if you have one- You are special just like the special gemstone you own. Have a look at the video to experience and feel the brilliant beauty of this Colombian Emerald set in 22 K Gold ring. See how nature has worked its miracle over a million years to make this wonderful specimen. The colour is a bright vivid green- resplendent, bright and exotic. The colour is spread evenly in the emerald crystal. Fashioned into a beautiful Oval and having exceptionally high clarity level this emerald has asacred shade making it is powerful Jyotish Gemstone that shall deliver the promised results only Jyotish Gemstones are capable of delivering. You can get the finest emeralds for your collection at Gemstoneuniverse.. Here. Perhaps the most maligned of all Gemstones amongst the Navaratna Gemstones is the Blue Sapphire the Gem of Lord Shani. It creates fear, anxiety, and apprehension among many people. Here I shall share 5 tops tips for a successful and effective trial for a Blue Sapphire. These 5 principles have stood the test of time and we have used them for over 2 decades with good, effective and measurable predictable results. 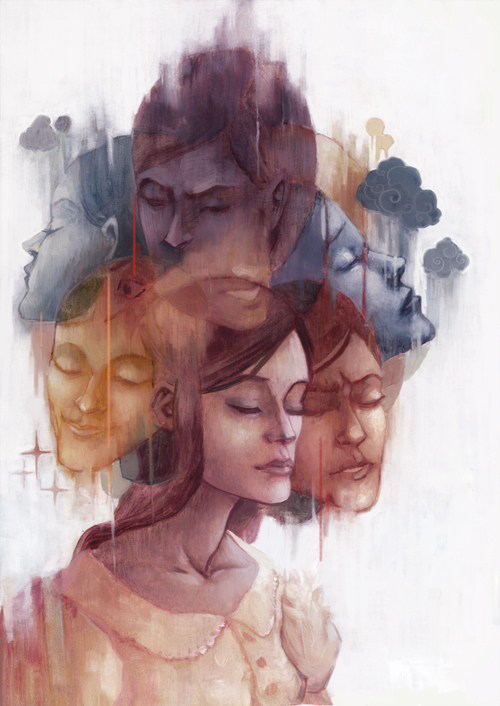 The important key words here are measurable and predictable for if the mind would have a free run in the flights of fantasy it would be very difficult to quantify symptoms and results. This piece is especially for those who have emotions on the lines of fear, anxiety, apprehension, belief in the myths surrounding this beautiful Gemstone. Why Should a Blue Sapphire be tested and tried? If a competent expert and astrologer asks you to test a Blue Sapphire then you should definitely opt for it. If the Blue Sapphire is clearly indicated in your birth chart and you are certain about the quality of the Blue Sapphire and are sure that it is a true Jyotish Gemstone free from flaws then no test is required and you can wear it on the auspicious time without any trial. However there are some conditions in which your astrologer or Astro gemologist may advice you to go for a trial. At Gemstoneuniverse we have had less then 30 trials for Blue Sapphire in the last 20 years. Detailed reason for that can be found here. – Operation of tough Saturn Transits such as Sade Sathi, Kantak Shani (Saturn Transiting 4th to the Moon), Ashtama Shani (Saturn transiting 8th to the Moon sign). – Commencement of Saturn Major Period or Saturn Sub period wherein Saturn is an important planet in your chart but is posited in an inauspicious house( 8 th house, 12th house etc), enemy sign or debilitation in Aries. – Individual is involved in Saturn related professions or suffering from classic Saturn related maladies. advise the test and trial for the Blue Sapphire and it is a good way to assess tolerance towards this gemstone. In the practical world, if you are not sure of the Astrologers recommendation, or you are not sure if the Blue Sapphire is a true Jyotish gemstone or is free from the flaws as indicated in the sacred texts then one, should go in for a trial 100% without exception. Most of the negative results that lead to fear and anxiety manifest when the recommendation is poor or the stone used is commercial quality junk as per the Gem Pyramid or full of flaws as indicated in the sacred texts. – The recommendation of your astrologer inspires confidence in you. 1) Do the trial in the Pratyantar Dasha (Sub Sub) Period of a planet that is posited well in the chart. Avoid trial during the operation of malefic and stressful periods. Ensure that when you are trying out the Blue Sapphire you are free from any physical ailments such as Fever, Flu. 3) Before tying the Blue Sapphire on the Trial Night contemplate, meditate and pray to your favourite God/Goddess/ Isht Devta and ask for Blessings that the Blue Sapphire suit you and bring you good luck and news. whether it is suiting or not can be found here. 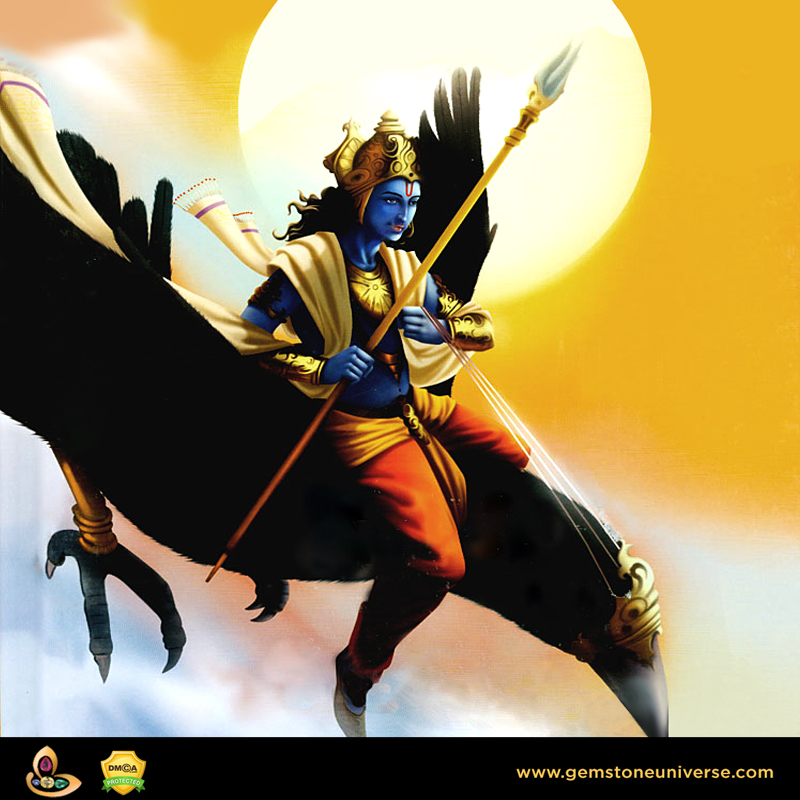 4) Pray to Lord Shani (The Ruler of Blue Sapphire) to bless you with grace and success in the trial. 5) Be Free from anxiety, fear and look forward to a successful test. If your Astrologer has made a good recommendation and the Blue Sapphire is Jyotish Quality the Blue Sapphire shall surely suit you and Lord Saturn shall bless you. 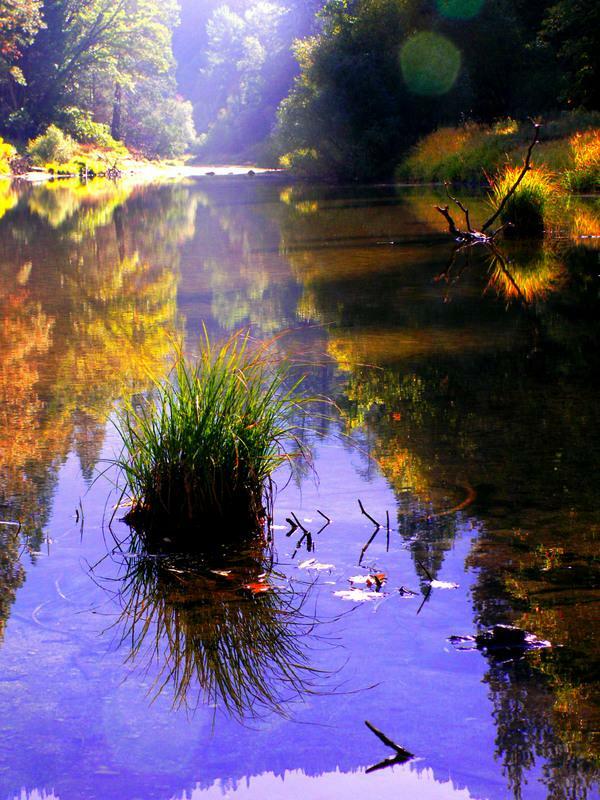 Be hopeful, optimistic and look forward to the next morning. I am sure that if you follow these 5 tips the Blue Sapphire shall suit you and you shall successfully and safely wear the Blue Sapphire with confidence and good results. Keep it simple and results will follow. If you are still iffy or not sure after the trial postpone the gem therapy and take sometime before you do a fresh trial. Reading tips about Gem Therapy here will be of great use. Comments View the Video to truly appreciate this Sattvik and Blue Sapphire. Stunning and mesmerizing Blue Sapphire from Ceylon all of 3.03 carats that excels on all 4C’s of cut, colour, clarity and carat weight. 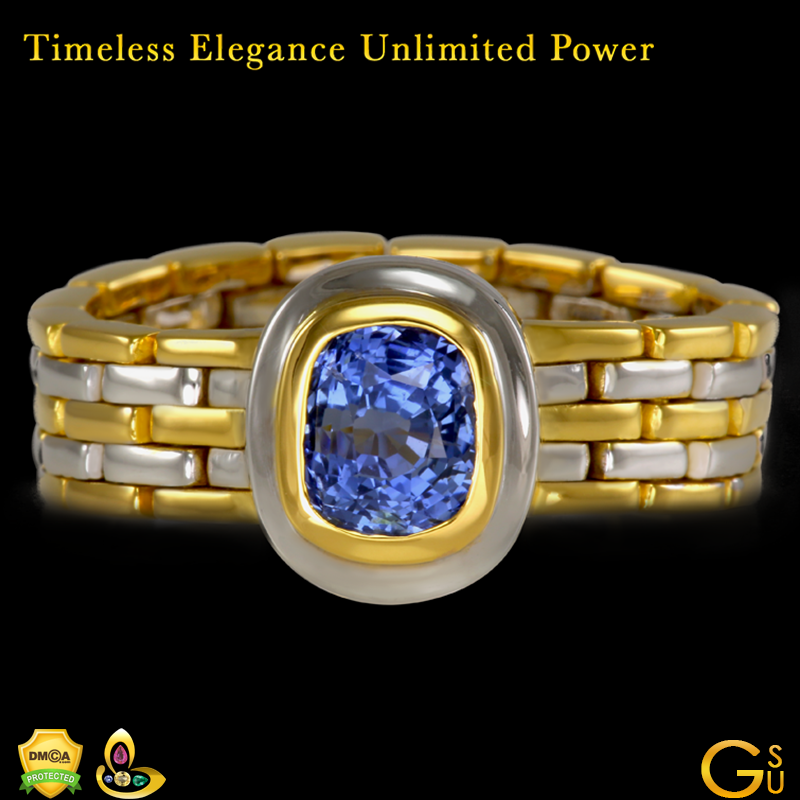 Brilliant, inspiring and liberating Blue that radiates equally all throughout the Gem. The mixed Oval Step cut makes the movement of light dramatic and ensures maximum reflection and lustre. The Gem itself has eye clean clarity. The design adds to the luxury of this ring with the contrast of Gold and Muted White add to its style value. A True Jyotish Gem that Shall deliver results only Jyotish Gemstones are capable of. Jyotish Gems can only be experienced and no words or details of 4C’s would be adequate enough to describe their purity, power of Value. For Lack of Better words they are Divine and Miraculous. * Exchange rate at the time of featuring. 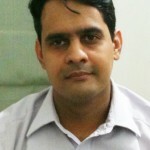 Raghav Hawa has trained and practiced Astro Gemology under Guruji Shrii Arnav for 2 decades. He is an Accredited Jewellery Professional from the GIA-Gemological Institute of America and a Certified Planetary Gem Advisor from the Planetary Gemologists Association-Thailand. 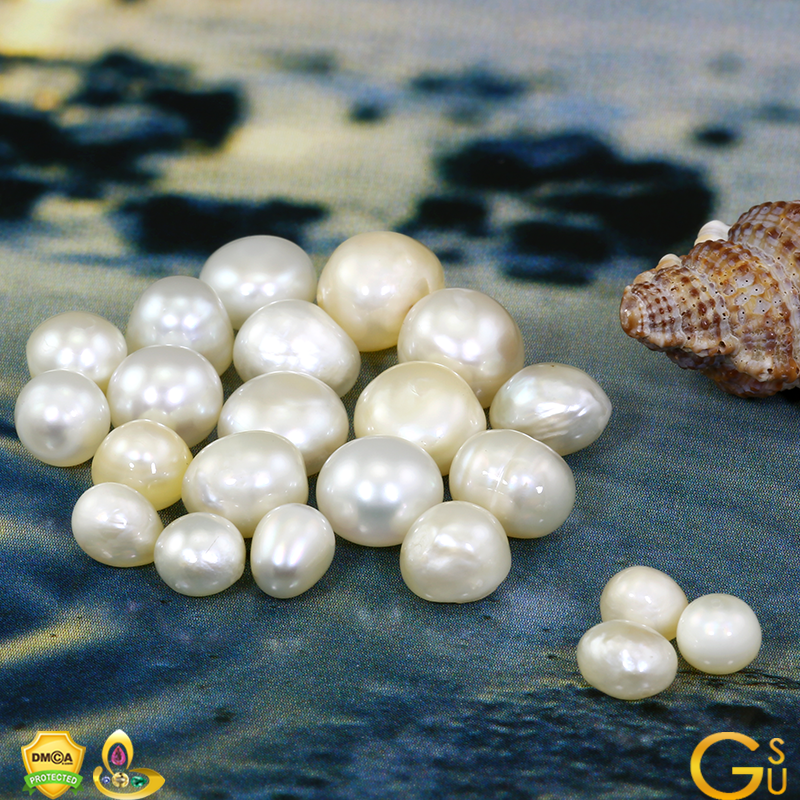 Buried deep in the heart of the ocean are several treasures, but natural pearl is probably one of the best that has been made available to the human beings. It is said in mythology that only on the day when Swati nakshatra occurs – on that particular day, if a raindrop reaches into the mouth of an oyster does a pearl form! 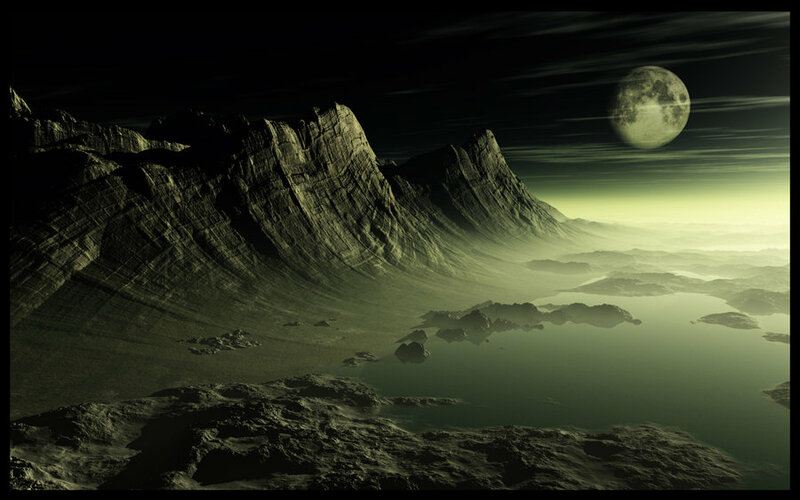 So in a way, it is a direct blessing from the heavens that awaits discovery in the mysterious depths of the ocean. one that bears the maximum brunt of generalizations (in context of astrological gemstones)! God forbid, if one displays temper, even before the birth chart is analyzed, one will promptly be suggested a pearl for calming down, irrespective of the fact that it could be an unsuitable gem. 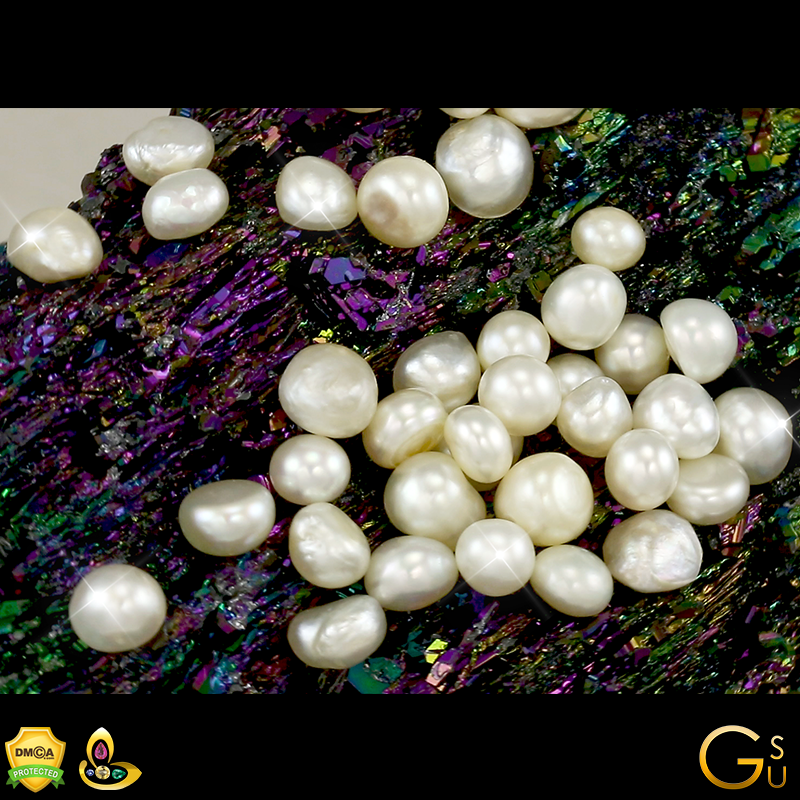 If worn after a suitable recommendation, a good organic natural pearl can be the panacea for many issues faced by a person. 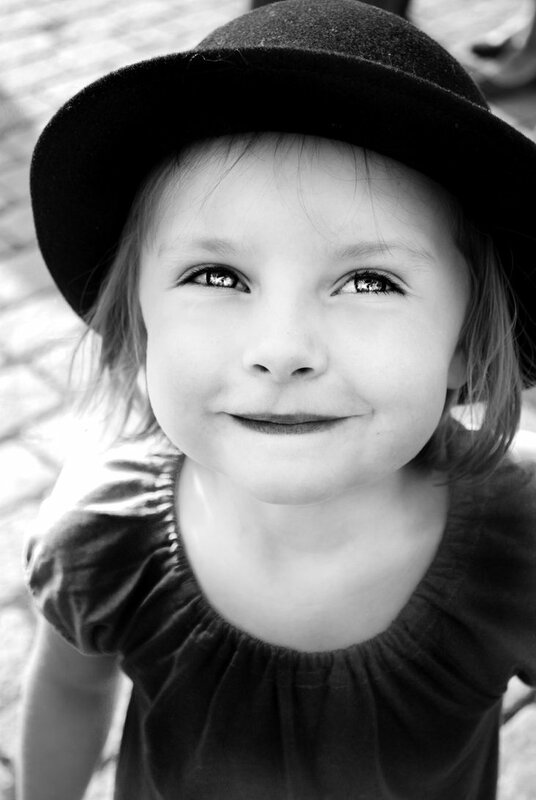 There is no questioning the fact that a good emotional quotient is vital for succeeding in the material world. You could give a person a large sum of money or the best resources but if emotional balance is missing, success would most likely elude this person. 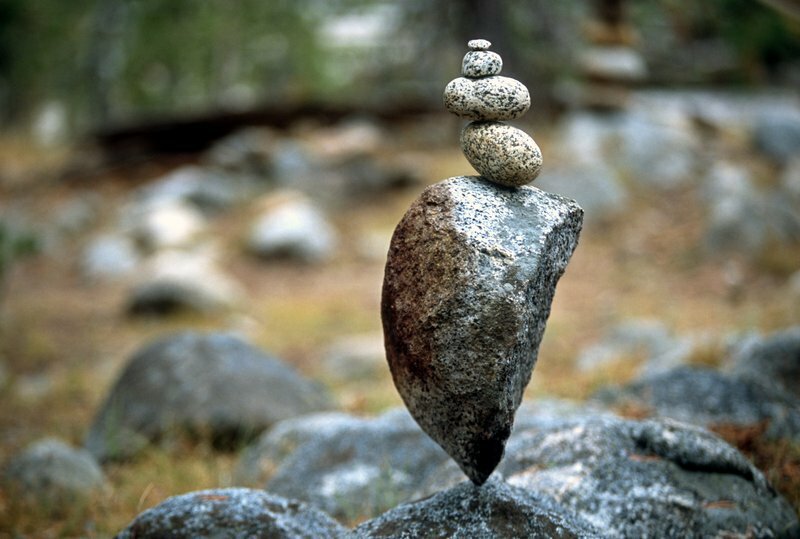 Emotional balance is one of the biggest resources a person can have and this is controlled by planet Moon/ Chandra. And natural pearl is the gemstone of Moon. Here are some of the healing benefits one could register within ones personality upon wearing the natural pearl if moon happens to be a natural benefic or a yogakaraka in the birth chart or is advised after a detailed astrological gem consultation. – Lesser mood swings : One can get a relatively firm grip over one’s emotions where they threaten to derail day to day functioning. Interpersonal relationships can be smoother as the unpredictability of temperament gets reduced considerably. This is very important, for others may not want the constant problems associated with an unstable person – guessing the mood, approachability and method of working! complex of not doing enough. natural pearl also balances the maternal instinct and alongside fosters a good sense to nurture oneself too! – More balanced thinking: Time and again life puts one in tricky situations where choices must be made and often times, these are close calls! It is very easy to get swayed emotionally, if it concerns people around. To be objective, free from biases and to function in a more balanced fashion is a blessing of Chandra. Wearing a natural pearl can give the excellent gift of being able to think and not emotionalize critical information. One cannot be damaged emotionally, if one is smart enough to know self-preservation and nurturance. 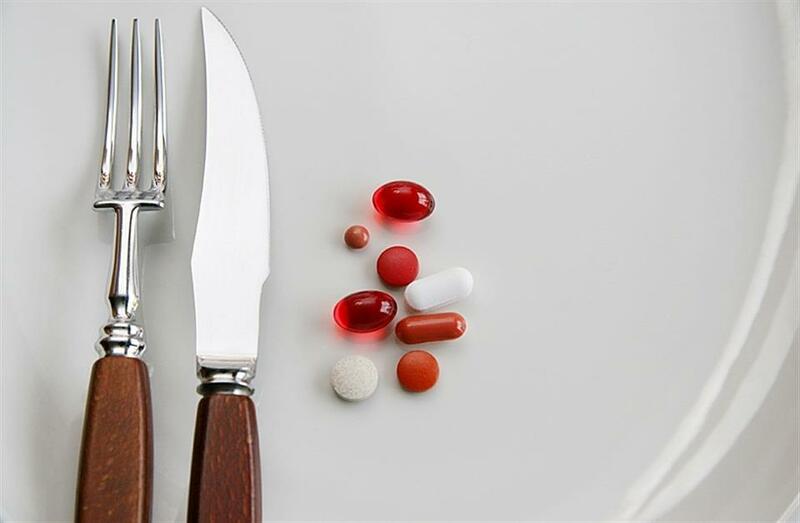 with bringing down chemical dependency of any kind. – Relief from long standing grief and trauma: Now this is probably one of the best outcomes of wearing a natural pearl. If there is long standing grief or emotional trauma, especially stemming from the childhood, wearing a natural pearl could help ease out old wounds and scars. 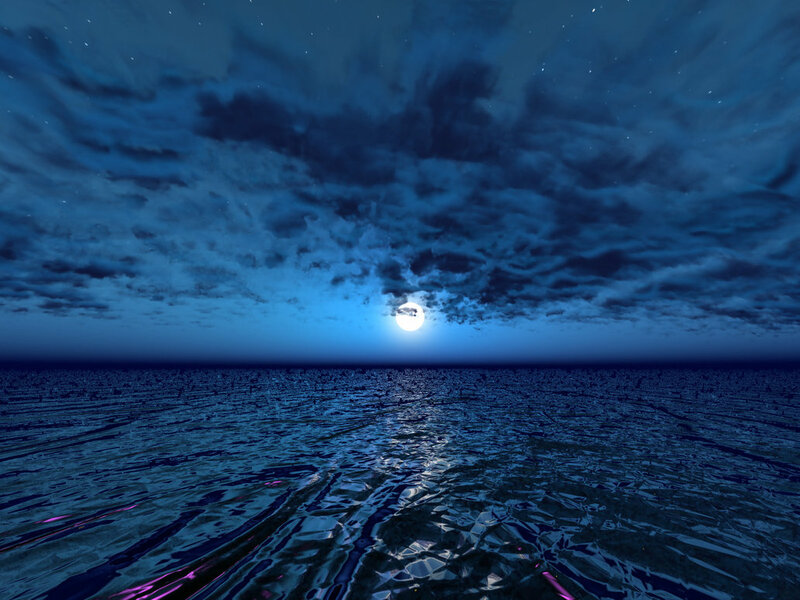 Moon is the mother planet in the zodiac and wearing its gemstone can act as a protective, healing talisman. It can subtly work away the emotional knots bringing much relief. The individuals with Cancer, Scorpio and Pisces ascendant rising can certainly benefit a lot from wearing a natural pearl! is Senior Director, Astrologer and Planetary Gemologist at Gemstoneuniverse. She is a certified Planetary Gem Advisor from thePlanetary Gemologists Association and Accredited Jewelry Professional from the GIA. 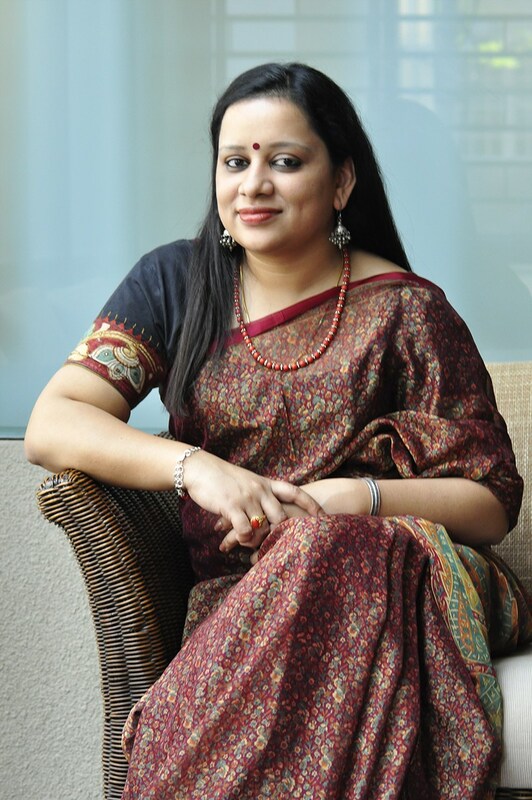 Prior to her soul-level engagement with the world of Vedic astrology, gemstones and association with Gemstoneuniverse, she had a long stint in ‘word smithy’ ! She’s had professional stints at Mudra institute of Communications, Ahmedabad (MICA); RK Swamy BBDO, Bangalore and Times of India.